Coffee has been everything from a treat to a job to a hobby for me. 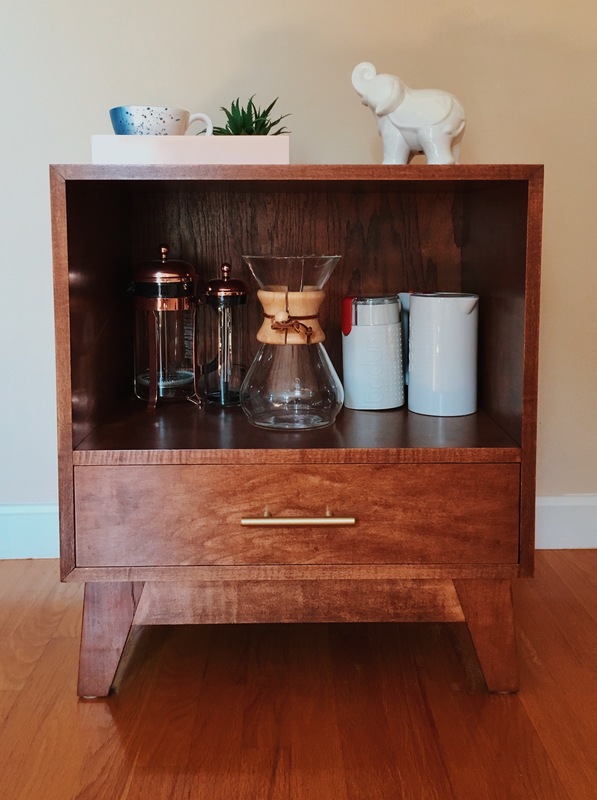 So tomorrow being National Coffee Day is a joyous celebration for me, and the perfect time to share my newest coffee related journey – my coffee station! I truly believe coffee cart should be the new bar cart. 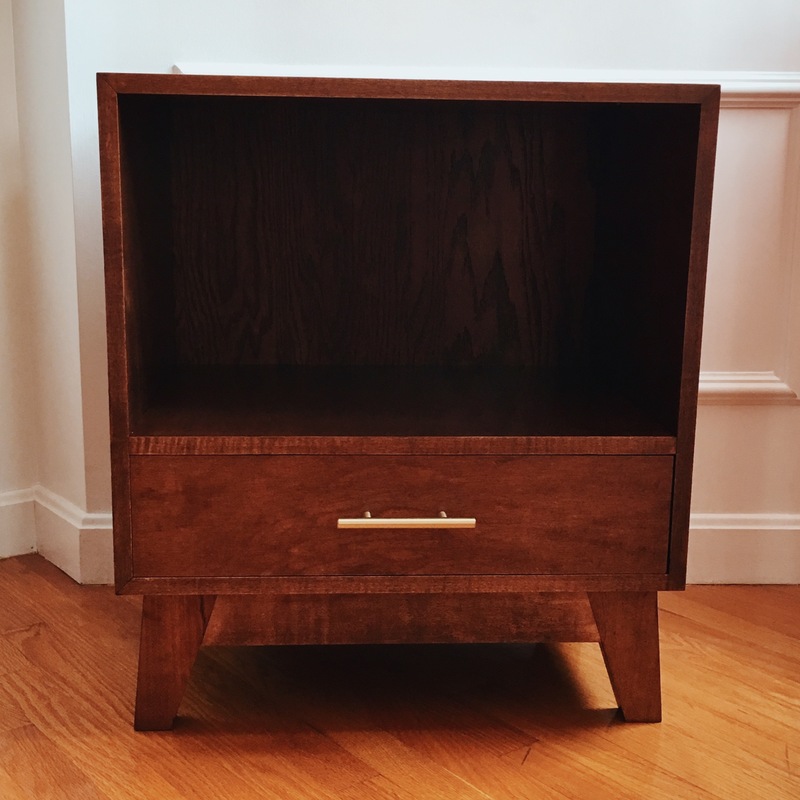 However, I don’t love the functionality of ‘carts’, so Bryan built me a gorgeous side table to house everything in (follow him on Instagram for more furniture and wood projects @thinkwoodthoughts). Step One: The Coffee. 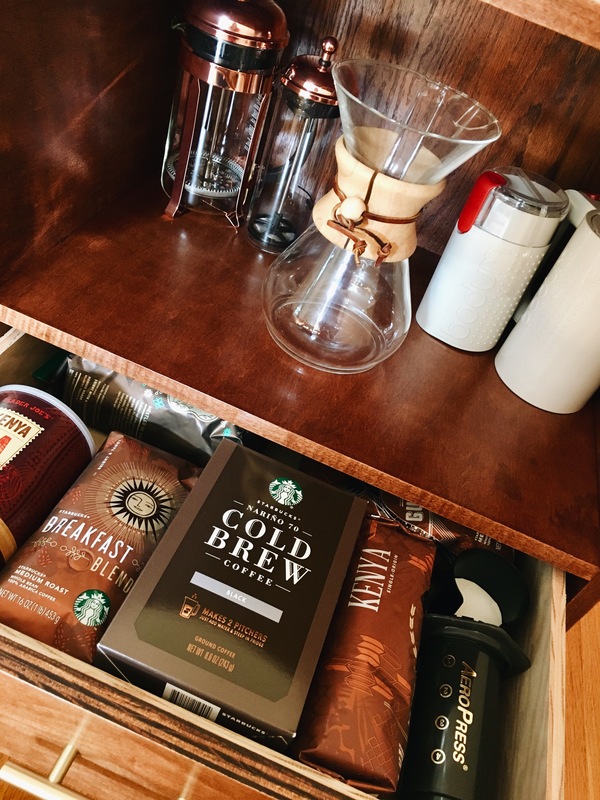 If you already have bags of coffee haphazardly stored all over your apartment, you can skip this section. If you’re looking to get into making coffee at home, but aren’t quite sure where to start, then keep reading. Craft coffee can be quite the expensive hobby to get into, but there are plenty of ways to get decent coffee without totally bleeding your bank account to try. While it’s great to brew coffee within two weeks of its roast date, the average person isn’t going to notice a difference, meaning your options for coffee beans are seemingly endless. Starbucks is always a safe bet for quite a few reasons. The accessibility is unmatched, you can walk into the cafe or grocery store of your choosing and out with a bag of coffee without probably straying too much from your daily routine. The downside of Starbucks is, while they are all perfectly fine, none of the coffees are truly great. For coffee beans on a budget, there is no better place to go than Trader Joe’s. Your local coffee shop is the best place to start. You can test out some of the roasts by the cup before committing to a full bag of it. Plus, you’re more likely to get beans within that sweet two week roasting period for maximum flavor. For the Very Serious coffee drinker, a subscription service may be the best way to go. I’ve been dying to try one from Blue Bottle, but there are many others available such as Stumptown and Counter Culture. Of the methods available for brewing classic coffee, these are my rankings. #1: Chemex. Scientists tend to recognize Chemex coffee makers as a glorified erlenmeyer flask, which is fitting since Chemex was actually designed by a chemist looking to leverage his experience into creating a superior cup of coffee (he succeeded). If you’re looking to make multiple cups at the same time, the Chemex is pure gold. It makes the same amount as your average Mr. Coffee, which means about two mugs for two people. The cone method of brewing by far delivers the best flavor, but the Chemex takes it one step further. Besides being aesthetically pleasing, their benefit is two-fold. The glass doesn’t absorb oils the way plastic does, and their filters are thicker than all others, doing a substantially better job at keeping the grounds out of your coffee. This tech pairing really enhances the flavor and produces a clean tasting cup. It’s also relatively easy to clean, and if your second cups get a little cold, they’re pretty easy to re-heat directly on the stovetop (on a low setting!) later on. The con list is pretty short: they are a bit pricey and the filters can be a bit difficult to find (they aren’t sold in most of the grocery stores I go to, I have only seen them in Williams Sonoma, local coffee shops, and on Amazon). #2: Pour Over Cone. The cheap plastic may not look as cool as the Chemex, but your standard pour over cone is much cheaper and (almost) as tasty. You also will have a super easy time finding affordable filters in the grocery store, and an even easier time cleaning it. To top, a cone is also the easiest way to make iced coffee. Just make your coffee at double the strength, and put your iced cup directly under. Pour-overs give you maximum control over your coffee than any other brewing method, but a conventional cone just lacks the thicker filters and the glass of a Chemex, at a lesser price point. There are also some ceramic ones available, if you’re looking for a more aesthetically pleasing option. #3: The Aeropress. This is the newest method of coffee brewing to me. If you’re tight on time, the Aeropress is the way to go, since it makes coffee almost instantly. It’s also super easy to clean, and makes pretty decent Americanos. #4: Drip Machine. Drip machine coffee makers aren’t too exciting, but they get the job done. A lot of the art is taken away by this method, but if you’re looking for something you can set a timer for in the morning and set up with relative ease, this is for you. This one is on sale now for a great price! #5: The French Press. For some reason, everyone decided that the french press was *The Coffee Method* you needed to prove your adulthood. Honestly I’m just not that into it. It’s hard to clean, makes extremely thick coffee, and doesn’t make much of it. Grinder. If you’ve decided to purchase a grinder, I would definitely recommend a burr grinder (over a blade model). Blades will chop up the beans into uneven sizes, so the smaller pieces can be problematic, especially in french press brewing. Burr grinders, on the other hand, dispense perfectly even sized pieces, leading to an even extraction of flavor. The size of your coffee grounds is HUGE for extraction flavor: uneven grounds can lead to a bitter or bland tasting coffee. The one I have pictured above is a blade model, and it works okay, but is definitely not as good as the burr one Bryan has. This one gets pretty good reviews for the price, and will probably be the one I try next. Electric Kettle. A standard kettle would heat up water just fine, or even a saucepan for that matter. But I happen to love the ease of electric kettles. Frother. While not necessary, a milk frother can be a pretty cool thing to have. There are manual, electric, and hand held models that are great if you prefer lattes or cafe au laits. Storage Jar. If you want to keep you beans in an aesthetically pleasing jar, I’m partial to this one from Bodum that matches my frother and french press. Mugs. I don’t know what you guys want me to say. Mugs are mugs. Everyone seems to have 40 mugs, but we only use what, one or two a day, max?! Thanks so much for stopping by – hope you all have a wonderful time celebrating tomorrow!